The Porsche Boxster has distinguished itself as a truly affordable choice to its cousin the 911. The Boxster features a finely balanced engine and quickly became part of the Porsche legend. After more than a decade in production, the classically styled Boxster remains a serious luxury roadster and a huge hit with drivers. The first-generation Boxster (the 986) was first introduced in 1996 as a 1997 model. In 2000 the S version was introduced with a larger, more powerful engine, however there was no change to the convertible top or top frame. In 2003, the Boxster received a styling update, including updating the rear window from plastic to glass. This required a new convertible top pattern to be designed and the inclusion of a glass window as standard. The 2003 and 2004 models were reasonably similar. To update the look of the original Porsche Boxster, the Convertible Top Aftermarket designed a glass window option for the 1997-2002 Boxster. 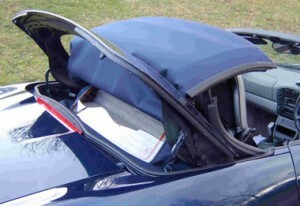 1997-2002 Boxster Glass Window tops, like the new models, have a smaller rear window to allow it to fit into the top boot. 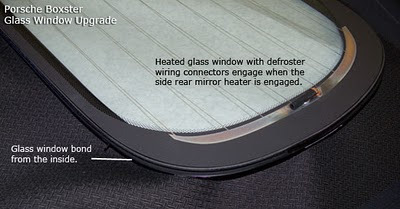 Glass windows are generally slightly tinted to match your front and side windows and has the embedded defroster glass wiring and a new wiring harness to connect it to the existing electrical system. How Well Does the Window Fit? The Boxster glass window is a DOT approved aftermarket window with the safety emblems and includes embedded defroster wiring and a wire harness kit to connect it to the vehicle's electrical system. Like the newer Boxsters, the glass windows for the 1997-2002 Boxster are smaller than the plastic window. This is necessary since the larger plastic window folds when it is retracted into the top boot. Glass window size is 35.5" wide by 12'' tall to allow it to fit into the boot properly. Of course, not all convertible top windows are bonded the same way. Some of the cheaper methods involve gluing the canvas to the glass with a silicone. Another method is to use a heat sealing process, which is a step up from silicone bonding. The best method we've found is where the topping material is wrapped around an internal support structure and adhered to the glass using specialized robotic equipment resulting in a finished appearance like the one shown here. The trade-off is a slight loss in visibility because of the size and a big gain in clarity in your rear view mirror looking through glass compared to a plastic window that will discolor over time. To read more about this new convertible top glass window bonding system go here. If you are an owner of a soft-top convertible car or are thinking about buying one, you probably know how important detailing is when it comes to the overall look of the car. Unlike hard-top convertibles or standard cars, which have a hard shell top that matches the rest of the body, soft-tops are made out of a material, usually canvas or vinyl, that is stitched to fit over a retractable frame. When purchasing a new convertible there's not much to worry about, as manufacturers have perfected their craft over many years. However, the issue you'd have to worry about is when you inevitably have to replace the top, and might end up settling for a replacement that doesn't compare to the one from the manufacturer. In general, when choosing a replacement top, an issue for the soft top convertible is the rear window. The plastic window has it's benefits, but needs replacement over the lifetime of the top because it isn't very durable and gets discolored pretty fast. The glass windows, although not used in classic convertibles, have become the fan-favorite lately due to their durability and long lasting clarity. Really the only issue is that with some cars the glass window, which isn't flexible, has to be slightly smaller in order to fit in the car's trunk. If you do choose to replace your top with a glass window make sure you choose a replacement top company that uses an advanced window bonding system that compares to the manufacturer. This bonding system has a clean, finished look and doesn't require any piping, which would rim the outside of the window, ruing the look. Ideally, you would also want to find an aftermarket convertible top company that offers what the car company original does, and more. This means that they only use the highest quality fabrics, or those that are used by the car company itself, but can offer a wide variety of styles for the make and model that you own. This way you will be able to have an edge on the person who is buying from the dealer, because you will have more color and texture options with the same quality construction as the original manufacturer. 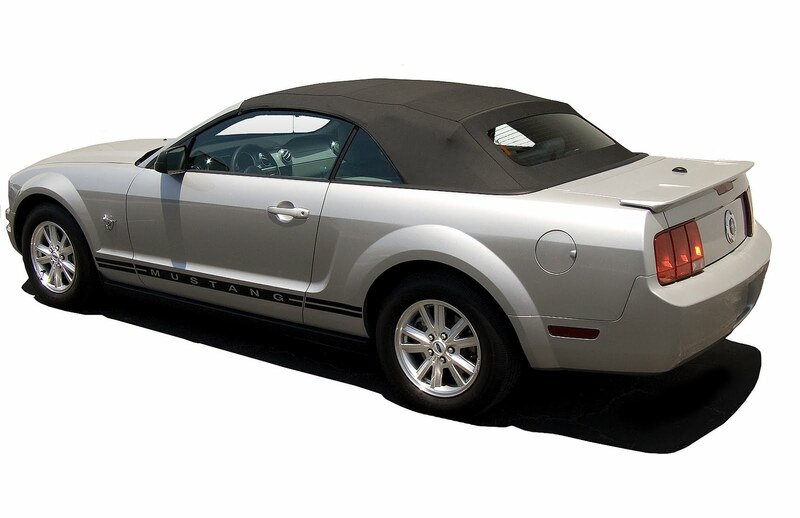 When you have the confidence and peace of mind that your convertible top can look like it's just of the lot, or even better, then you know you found the right aftermarket convertible top manufacturer. Whether you choose a local shop, or internet based replacement convertible tops company, you should make sure that they can offer you the quality top you deserve.